Originally this famous Great Grandmaster, already in his 70’s, had planned to teach young Chee intensively for a full year. In the event, so successful was he at grasping the knowledge taught, that Great Grandmaster Lin Xian taught him for a further two years, until the limit of what he could teach was all but exhausted. A special and very important part of this Great Grandmaster’s training of Master Chee involved special tuition in the secret arts of geomancy, dowsing, palm and face reading, and Feng Shui. Also, Lin Xian, a learned scholar, in addition to teaching Chee such concepts as Five Element Theory and of course the I Ching (from which the Eight Trigrams/Ba Gua are derived), taught him much about the healing arts, herbal medicine, and calligraphy. The hard fighting arts of the Five Ancestor System taught by Lin Xian he had mastered, yet, he was still as keen as ever to learn more, and he was aware that in the field of the ‘Soft Arts’ he as yet knew very little, and yet understood how important a part these played in mastering the system at the very highest level. The thousand year old Boxing System, although known as FIVE Ancestor, also encompassed a sixth component/influence, namely that of the mysterious ‘Lady in the Green Dress,’ who refined and completed the System through the addition of ‘soft’ internal arts; the most secret, and perhaps the most deadly, of its special characteristics. Great Grandmaster Lin Xian, knowing that he could teach no more after three years training, received word to return to his home village of Teck Hua, in the North of China. The implications of his departure for the future martial arts development of Chee were debated with his sister, Ye Neo (also a great exponent of the arts, in particular the ‘Soft’ dimension of these arts, where Ye Neo had a fuller depth of knowledge than her brother). It was agreed after a heated debate that the sister would continue to teach further, specifically the soft/internal arts. [Direct quote from Grandmaster Chee Kim Thong in the Malaysian Straits Times : April 12th 1998]. 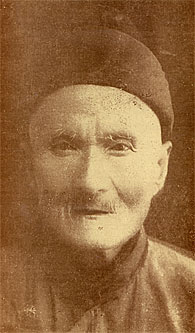 Shizu Chee recognized Ye Neo as one of the major influences in his martial arts development.